During excavations inside the Egyptian Pyramid of Sneferu, French archaeologists discovered a secret chamber. It was found below one of the pyramid's empty spaces using a so-called muon scanner. Latest publications along with materials about Pharaohs. Read about stories, mysteries as well as useful advice about Pharaohs. Obtain the latest news along with articles when it comes to Pharaohs. A little-known fact is that Cleopatra was actually the 7th Egyptian pharaoh to bear that name. She was the last representative of the mighty Ptolemaic dynasty that ruled in the African nation. One of the greatest enigmas, which has been puzzling us for thousands of years, has now been solved. The mysterious disappearance of a 50000-strong Persian army in an Egyptian desert in 524 B. C. was unriddled by Prof. Olaf Kaper from Leiden University. French and Egyptian archaeologists have discovered 5 kings' statue heads from the time of the pharaohs in Egypt. It is believed that the statues are from the era of the Middle Kingdom, founded in 2000 BC. 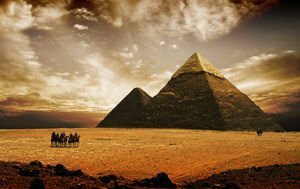 Ancient Egyptian civilization is very old and has undergone many changes over the past years. This article lists the most famous ancient Egyptian myths. Sesheshet is of the few women pharaohs that ruled ancient Egypt. Archaeologists have discovered apart of the mummy which implies that it belongs to Queen Sesheshet, reported Dr. Zahi Hawass. The world has always shrouded in mystery over the Pharaohs, Mummies and Pyramids. One of the most interesting is that of the young pharaoh Tutankhamun. It all started when Howard Carter found. . .
Tutankhamun, The Pharaoh of Upper and Lower ancient Egypt, died when he was barely 19. Mummified remains of Tutankhamun were found by the British archaeologist Howard Carter in 1922.